Not sure what "level" of school you're in, but if I was going to build something, I would study the somethings that have already been built. Go look at a bunch of gokarts and move the steering wheel and see how it's all connected to the front axles/wheels. It's basic geometry. I think if you play with it a few minutes, you'll understand it easily. I'd also suggest that everyone on the team do internet searches for basic dc electricity, dc motors, and batteries. Then, get together and discuss/share what each of you has learned. I'd suggest you understand the terms: volts, amps, watts, amphours, and what each one means and how they are related. There are a lot of interesting and fun things to learn. I hope you all enjoy the process! When you get going on the project, come back here with pics and specific questions, and we'll do our best to help. When does it need to be completed? What design parameters were you given? You'll find parts at Nortern Tool. A: Because I'm obsessive about doing things. I have a Friday night class om Vacuum Infusion, can you believe? I totally tanked my midterm tonight, I'll bet I'm under 95%. Get up in front of the class on Monday and explain Ackerman and you'll be a bigshot for a short time. You can keep coming up with other things to stay on top, if you try. I was also planning to recommend looking for existing Go Kart Plans. Let's turn the safesearch off and get some really DANGEROUS kart designs. One place you might look for a motor. 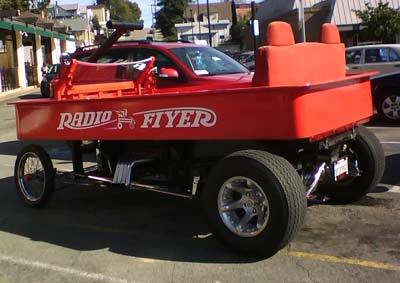 Since the 'Radio Flyer' replica has been so popular lately, (You see the news story a few days ago of the elderly Alaskan couple that built one?) maybe you could slap one together. I've heard so many people claim they electrified their little wagon way back when, let's see you get the adult sized version juiced. Here's the one that was on 'Home Improvement' some years back. This one is on the kitcar 1923 Ford chassis.